When style and finesse both leave by the back door (due to fatigue after a week long epic battle of racing), resorting to brute strength and ignorance is equally effective. Time for rest, food and chilling out. Quick update to say, "Yey, I won the final stage! ", as well as securing second place overall in the fastest women's BC Bike Race ever, clocking up 330km of the world's finest singletrack and 10,000m of climbing in under 20 hours in the shadow of Wendy Simms. Super proud of myself. Proper blog update to follow...in the meantime, huge thanks to everyone who supports me, especially those who encouraged me to get back in the elite racing saddle. What a cool journey over the last 18 months. 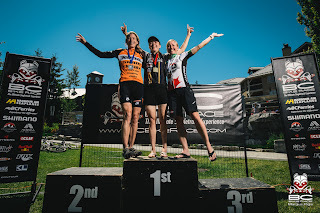 Stage 7 podium in Whistler - top step! !